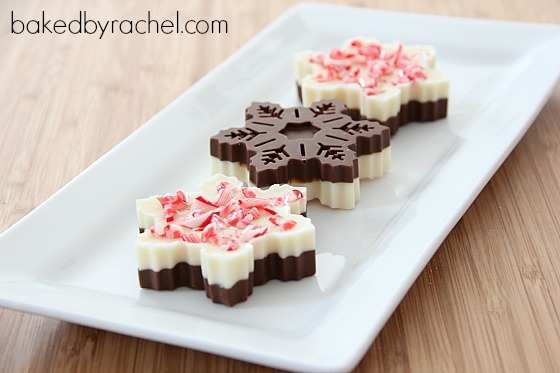 Easy homemade snowflake peppermint bark, perfect for holiday gifts! There are exactly twenty four days left until Christmas! Are you freaking out yet? Since it’s December first I decided to start the month with a fun memory and giveaway. Let’s jump right into the spirit of things shall we? If you’ve been stopping by for at least a year, you might remember these. I had to redo them. Well, I didn’t have to but I really wanted to! They’re way too cute and fun to pass up making. I think they’ll become a yearly tradition. The girls were dying to grab them and take a bite. Since making them last year I’ve had many comments asking about the mold – where did I find it? It’s a regional store but unfortunately they only carried that mold last year! I checked this year. I was sad. I wanted to buy some to give to some lucky readers – you! Apparently the stars were aligned because on another trip back I happened upon one lonely blue snowflake mold sitting with the loads of green trees and red gingerbread men. One! I snatched it up so fast. There was no letting that sucker go. crushed candy canes or peppermint candies. powder removed (See picture tutorial). 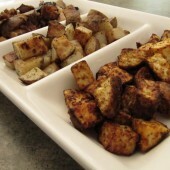 In a small to medium sized bowl add milk or dark chocolate and 1/2 tsp vegetable oil. Melt in the microwave in 30 second intervals at 50% power. Stir well after each 30 seconds. When fully melted, add 1/8 tsp peppermint extract. Stir well. 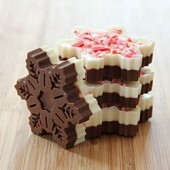 Using a small cookie scoop or spoon, divide chocolate among snowflake mold cavities. Sprinkle with crushed candies. Chill for at least 30 minutes or until chocolate has set. Repeat process with white chocolate. Remove from molds after fully hardened. Store in the fridge. Peppermint bark tutorial recap: For a step by step picture tutorial - go here. 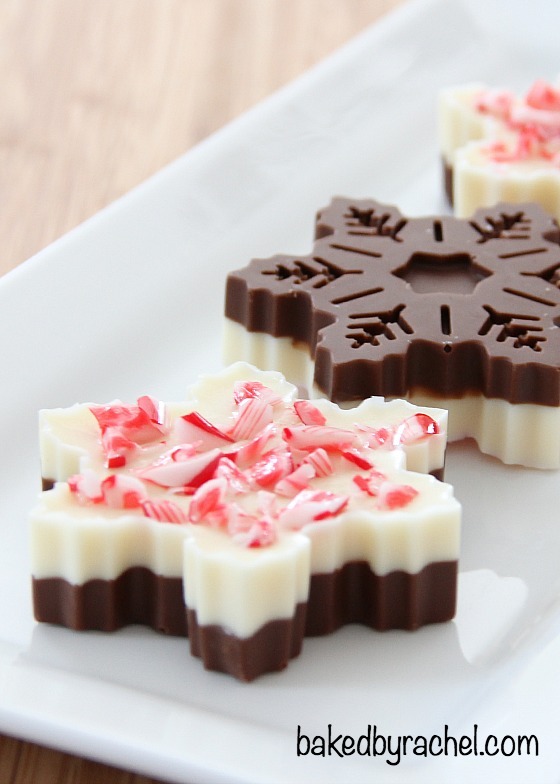 *Makes 6 snowflake peppermint bark pieces, if using this mold. 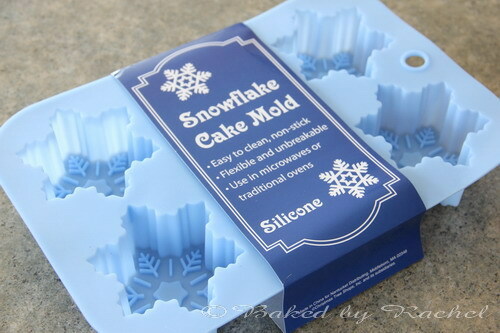 Double ingredients for thicker (like pictured) or for 12 snowflakes. So pretty! I love making cookies with my mom! My tradition is to open presents on Christmas eve, enjoying the lights of the tree. We also drink hot cocoa while searching for our favorite tree! 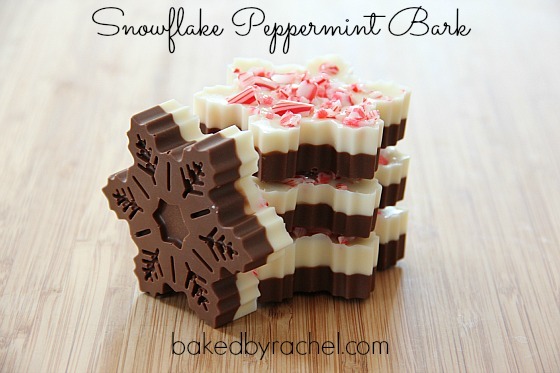 Like you on FB, the peppermint bark looks devine! I am so into peppermint this year! My fav is cutting down our own tree! My favorite holiday tradition was always my dad reading “‘Twas the Night Before Christmas” to us as kids – we’re all adults now and it’s still a tradition we keep going. Wow these are too cute! My favorite holiday tradition is breakfast with the family on Christmas morning. Such great food! 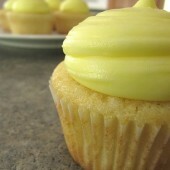 Ohmigosh, these look so good! I would lose all self-control with these puppies, I’m sure. Can they be my new Christmas tradition? We always watch Charlie Brown on Christmas Day…we love that Snoopy!!! Sooo pretty! Love the snowflakes! This mold would be awesome and what you made was so wonderful. I’d love to win it and then I could use it during my favorite holiday tradition: Our Annual Holiday Party which is marking its 19th year on December 18, 2011. I followed you under my actual name (TammyJo Eckhart) via Facebook as well. Those are absolutely STUNNING! I need to get one of those molds!!! I just pinned it. Took me a while to figure out what pin it means. Must be that turning 50 brain of mine. So glad you posted. Thank you! I follow your RSS feed. I like making a birthday cake for Jesus as a family tradition. My favorite holiday tradition is decorating the tree with my boys!!! Another favorite tradition is making lefsa with my mom. My mom & dad used to do it every year until my dad passed away a couple of years ago. Now my mom and I do it!!! I also shared this page……..
My fave tradition used to be cutting down a live Christmas tree the day after Thanksgiving and then hitting up White Castle for some sliders and hot chocolate with my family. Good times. 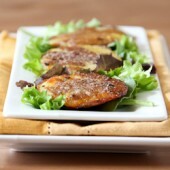 i follow you on fb and shared you recipe on fb! My favorite holiday tradition is making our kids sing for their presents:) Not every present, but we make them take breaks from opening and sing or recite Christmas related songs and poems. My favorite holiday tradition is going home to open presents and eat a big dinner with my family. can’t wait to find out who won! have you tested the mold out in the oven? I have one exactly the same but it says it can’t go in the oven, but I can’t figure out why. Your bark looks so pretty. I haven’t actually. Is it possible yours was meant specifically for chocolates and candies instead of baking? I’m in love with these. They are so pretty and so impressive! I’ve been making these today and have been having trouble. The chocolate (I’m using milk chocolate and white chocolate chips) congeals and starts to instantly thicken the second I put the peppermint extract in it. Is this normal? Am I using the wrong kind of chocolate? Would it better to use candy melts? I haven’t ever used chocolate chips in this way so I can’t be completely sure if that is the issue. I’ve had luck with both candy melts and bars of baking chocolate. If you’re using the microwave to melt, perhaps melting the chocolate (with vegetable oil) in a double boiler over simmering water would work better. So cute!! 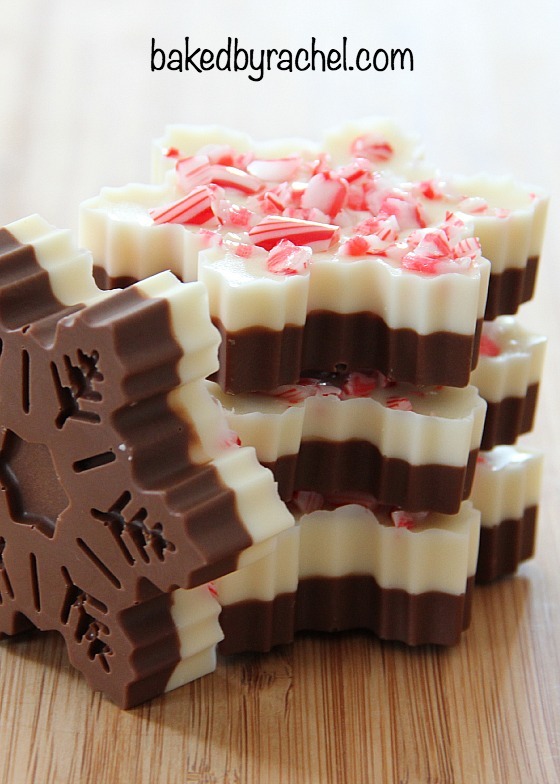 Love peppermint bark!